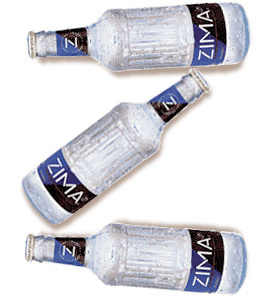 According to the Milwaukee Journal Sentinel, MillerCoors announced today that they will discontinue their clear malternative Zima, Arguably one of the first alcopops made in the U.S. when it debuted in 1994, Zima has managed to stay around longer than many of its competitors, including being remade with new flavors such as Zima Citrus, Zima Pineapple Citrus and Zima Tangerine. If you’re feeling nostalgic for just one last sip of the lemony malt-based beverage, the final shipments to distributors will likely be in December, meaning Zima should still be found on store shelves through the beginning of next spring. “This decision is necessary to reduce complexity when it comes to our brand portfolio, allowing for more focused activity at retail on consumer-preferred brands, especially Sparks,” Andy England, chief marketing officer, wrote in a memo released Monday by MillerCoors, a joint venture formed by merging Miller Brewing Co. and Coors Brewing Co. According to BrandWeek, alcopop sales have been down lately, presumably due in part to their being targeted by neo-prohibitionist groups in many states. Overall, the progressive adult beverage category is off 6.6%. Case sales of the Smirnoff Ice brand family are down 11%, while Mike’s Hard Lemonade brands are up 1% and Anheuser-Busch’s Bacardi Silver brands are up 10.4%. Please join us in our campaign to save our Zima!! we will not miss this. it is a sad sad day that i’m all in favor of supporting zimaguy. life will not be the same without that coveted clear liquor. what can we do?? ?